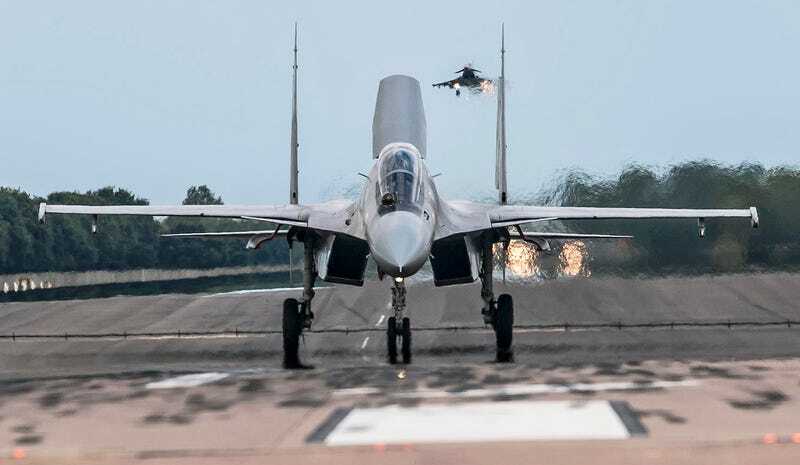 The Indian Air Force sent its most potent fighter, the thrust vectoring Sukhoi Su-30MKI advanced Flanker, to fight against and alongside the Royal Air Force’s most capable fighter, the Eurofighter Typhoon. Our good friend and master photographer Rich Cooper was on the ground and in the air to document this high-profile air combat exercise. Four of India’s Su-30MKI, their support equipment and crews made the long trip from their home base at Tezpur Air Force Station in Northern India to RAF Coningsby in the UK via the help of Indian Air Force Il-76 Tanker, C-17 and C-130 cargo aircraft. After the arduous continent hopping trip, the exercise kicked off on July 20 and ran through July 31st. The air-to-air combat dominated exercise, dubbed Indradanush (Rainbow) 2015, began with a number of dissimilar air combat training (DACT) 1 v 1 and 2 v 2 sorties, and slowly built into more complex large force employment missions. The most complex of all the scenarios occurred towards the tail end of the deployment, with four Flankers and six Typhoons escorting a pair of C-130 Hercules transports full of paratroopers to a drop zone deep inside “enemy” airspace. The opposition included ten “red air” adversary aircraft, consisting of a mix of Hawk T1s from No 100 Squadron out of RAF Leeming, Typhoons and other contract aircraft. The exercise, like any international training event like it, was great for relationship building between the two countries who already have a long history, but it also gave each side a highly intricate look into the capabilities and operating procedures of each other’s unique aircraft. For RAF Typhoon crews, who are often forward deployed to the Baltics for the NATO air policing mission there, getting an unprecedented insight into the Russian-designed advanced Flanker, similar to the latest Russian Flanker variants being fielded by Russia itself, was a huge plus. This includes experiencing fighting against the Su-30MKI’s notorious 3D thrust vectoring system, its NIIP N011M “Bars” passive electronically scanned array (PESA) radar, and its advanced Infrared Search and Track system all working together as a single integrated combat system. The same can be said for India and the Typhoon, not to mention getting a general insight into fighting a modern “Euro-canard” 4.5+ generation fighter with blistering high-speed performance and tight sustained turning capability. This is especially relevant as India has recently purchased the French-built Dassault Rafale, and there are rumors that the Medium Multi-Role Combat Aircraft competition that preceded the Rafale purchase, a competition that was plagued with never ending timeline extensions and negotiations, may be restarted, with the Typhoon being a possible candidate to fulfill it. Interestingly, the two aircraft are a pretty exciting match for one another when it comes to air-to-air combat. Neither are stealthy, but both have powerful radars, although they are not of the latest AESA technology. Both also are equipped with capable infrared search and track systems which allows them to the option to fight while remaining electronically silent. At the same time, their close in combat capabilities are different, with the Typhoon being able to better retain its energy state while turning very tightly, while the Su-30MKI is known best for its ability to use its thrust vectoring to point its nose at very slow speeds. As for exactly how each side performed when pitted against each other, as seemingly with most Flanker versus any western fighter type training events, there is some controversy as to how each side views the results of the exercise, with the Indian side already claiming to have bested the Typhoon on many occasions. This deployment is the Su-30MKI’s second to the UK, with another deployment occurring back in 2007 to RAF Waddington, although this deployment likely featured much more of the a Su-30MKI full capability set than the one eight years ago. This deployment also comes as there are strong rumors that the Su-30MKIs will be making a return to Red Flag (this time Red Flag Alaska) in the U.S. next year, although similar rumors have been proven false before. After concluding the exercise in the UK, India’s Su-30MKIs and their support aircraft made what will be a four day stop in Saudi Arabia on their way home. This was a historic occasion and marked the first time Indian fighter aircraft had visited the Kingdom, a move that underscored the increasingly close relationship between India and Saudi Arabia. For Rich Cooper’s full report, including pilot interviews and reactions from the exercise, make sure to pick up next month’s Combat Aircraft Monthly. In the meantime enjoy the rest of his awesome images of the exercise and make sure to check out his website and follow him over on Facebook.